The Tennant T5 is equipped with cleanable tanks, intuitive one touch controls, unmatched maneouvrability, long-lasting battery packs and on board charger. With the addition of the cylindrical scrub option it is suitable for cleaning in traditional industrial markets. The T5 can also come equipped with the FaST system or the ec-H2O technology. 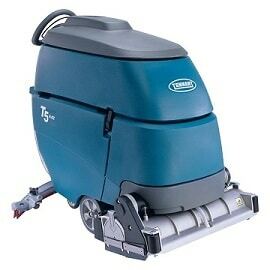 With its cleanable tanks, the Tennant T5 allows you to improve the hygiene of your working environment even further. All corners of the tanks can be accessed for thorough cleaning. This unique feature lets the T5 set the new standard for optimal hygiene. The option of FaST (Foam Activated Scrubbing Technology) saves; up to 30% more productivity, up to 30% cost saving and 95% savings on water and detergent compared with a standard scrubber dryer. The ec-H2O and FaLong lasting battery packs; provides up to 5 hours of runtime.